The 2015 Philadelphia Geek Awards statuettes were created by NextFab and continue the night's "Back to the Future" theme. Washington may have the White House Correspondents' Dinner, but Philly has the real "nerd prom." 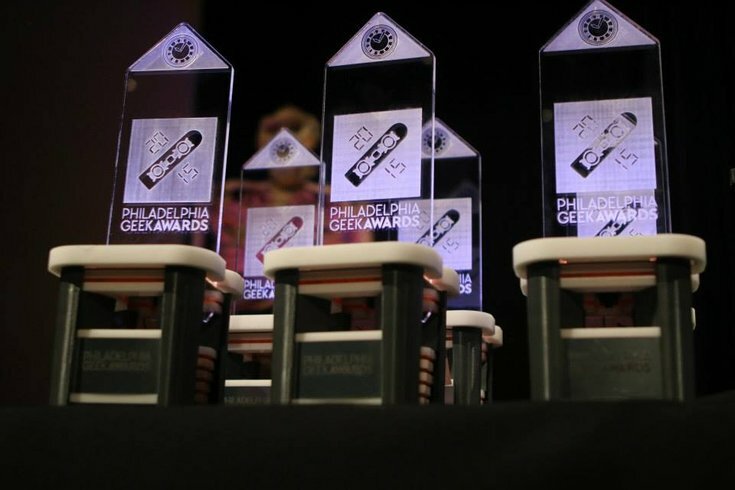 The Philadelphia Geek Awards, which celebrated its fifth anniversary this year, once again brought together the city's smartest, brightest and, yes, geekiest, to honor the community's high achievers. 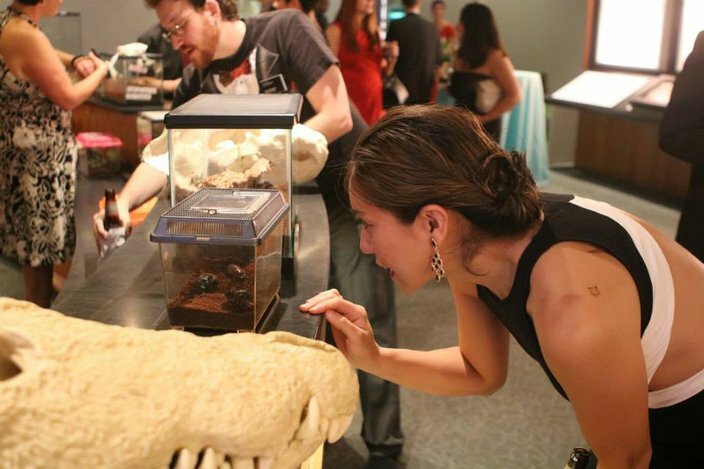 It all went down on the balmy evening of Saturday, Aug. 15, at the Academy of Natural Sciences of Drexel University. 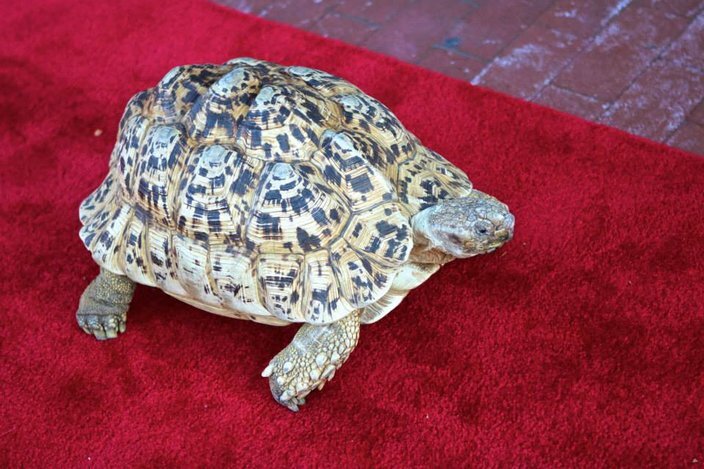 Scientists, comic illustrators, social media stars, web developers, filmmakers and more strutted down the red carpet (flanked by reptiles and a giant tortoise, naturally) and into the thankfully air-conditioned museum. 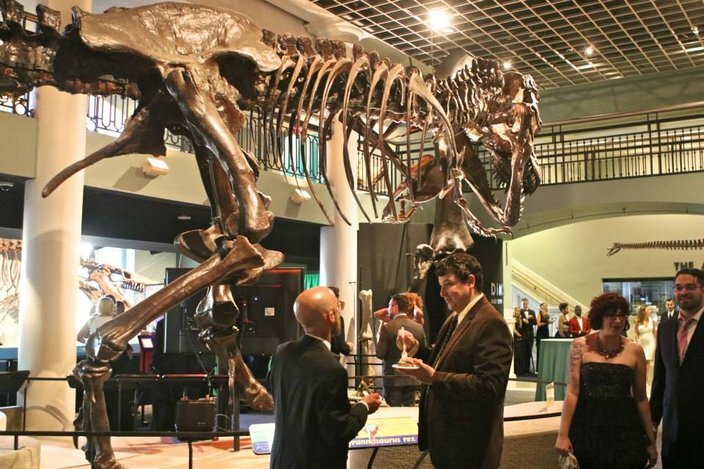 Once inside, guests in glittery gowns swished around Dinosaur Hall snapping selfies with a T. rex, mixed and mingled among multicolored butterflies and fawned over fossils. Around every corner, guests had the chance to get up close and personal with the museum's holdings, from its science-themed art gallery to live birds who dropped by to ruffle a few feathers. During the cocktail hour, nominees, presenters and attendees curious about "Philly's Best Party of the Year" chatted about whom they wanted to win the night. The Geek Awards truly honor the best of geek culture, from creatives using their skills to make us laugh to scientists searching for better ways to help their communities. Guests Nyasha George and Philip Asbury stood out from the crowd for their A-list outfits, and it's no wonder they were so finely dressed: They came out to support nominees Wale Oyejide and Lekan Jeiifo. The pair's line of Afrocentric menswear, up for "I.R.L. Project of the Year," definitely won the red carpet. 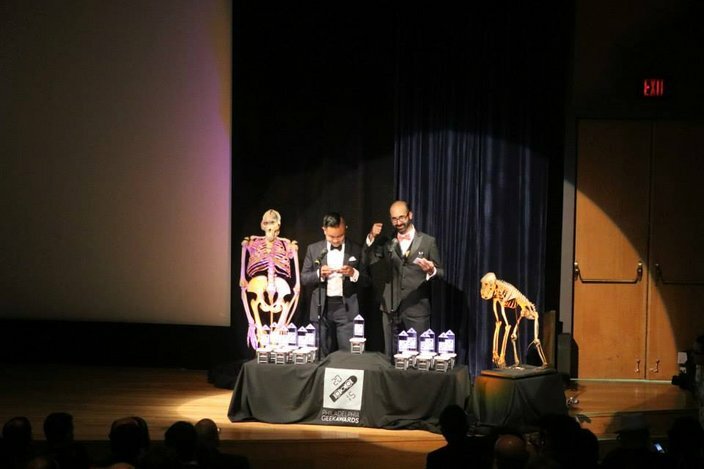 Asbury returned to the Geek Awards this year in hopes of helping his friend take home one of the NextFab-made statuettes. A project manager for Mural Arts, he nominated Ben Volta for "Visual Artist of the Year" in 2014 and then saw him win the prize. Prior to the ceremony, he hoped he might be a lucky charm. "We'll see how it goes, but I think I do have some sort of magic," he laughed. Dan Grebb, a third-time attendee, came out in support of Geekadelphia Editor-In-Chief and Geek Awards producer Mikey Ilagan; the two work together at Think Brownstone. "Every year I like to come out because Mikey and everyone involved works really, really hard to put it together," he said. Jen Finan came along with Grebb for the first time after hearing about the incredible projects Geek Award nominees were up to. "It's about people who are creating things to improve the city, so it's really great that there's an event to support that," she said. Once the buzz settled and guests were done wandering the Academy's hallowed halls, the well-clad group filed into the auditorium for the main event. Ilagan and Geekadelphia co-founder Eric Smith opened up the night with joyful remarks. (From the way the crowd responded to them - and the rest of the stage's visitors - you'd think the room was, in fact, full of prom queens and homecoming kings, not the nerds they all claim to be.) "Back to the Future" quotes filled time between award presentations, making the audience giggle and paying homage to this year's "Back to the Future Day" in October. To kick off the night, "Story of the Year," a sort of all-encompassing category for awesome things, went to the "Ant Farm Watch." Analog Watch Co.'s April Fools' joke topped them all when it sent up the hipster movement with its live "ant farm timepiece." Next, "Scientist of the Year" went to the University of Pennsylvania's "Twitter Predicts Heart Disease Team." This group of scientists connected the dots between language used on Twitter and rates of heart disease mortality. Karina Kacala, singer and Opera Philadelphia marketing manager, stole the show while presenting "Visual Artist of the Year" by singing an ode to each nominee. Filmmaker and journalist Cory J. Popp took home the prize but wasn't able to attend. "Comic Creator of the Year" went to Kelly Phillips and Claire Folkman of all-girl comic anthology "Dirty Diamonds." (You may remember Phillips from our March story on Philly's female comic creators.) Beating out Ian Sampson and Locust Moon Comics, the pair thanked their Kickstarter supporters before Phillips declared "Girls make f------ amazing comics!" to a cheering crowd. Will Stallwood and Fran Wilde put on a roaring mashup of Rock, Paper, Scissors and lightning-fast trivia while presenting (what else) "Game of the Year." Jason Tagmire took home the award for Pretense, his social metagame that's played over the course of your regularly scheduled game night. Jason Richardson, last year's "Geek of the Year" winner, presented "Streaming Media Project of the Year" while proudly displaying his Spider-Man tie, pocket square, cuff links and undershirt. Book Fight, the podcast hosted by two Temple professors about loving and hating books, ultimately won the category. "The White Mountains," a partnership between the University of Pennsylvania's School of Medicine, Chemical Heritage Foundation and REACH Ambler, won "I.R.L. Project of the Year." (For the uninitiated, I.R.L. means "in real life," aka offline.) The project, which bested Longwood Gardens' "Nightscape" and menswear line Ikire Jones' Africa 2081 A.D., is a performance art piece in which 10 playwrights combined environmental justice and local history. In an utterly meta move, Geek Awards producer Allie Ilagan and organizer Rob Hassler read live tweets about the event while presenting "Social Media Project of the Year." Nicole Angemi, the pathology assistant PhillyVoice introduced readers to in June, took home the prize. Her Instagram account is full of gruesome yet educational photos that show what goes on in the human body in dazzling detail. Upon accepting her award, a speechless Angemi blurted, "I normally deal with dead people, so I'm not good with live people." OpenDataPhilly's relaunch won the "Web Project of the Year" for providing the city with such a valuable resource, while Billy Penn won "Startup of the Year" for funneling original reporting and aggregated news into one location. Billy Penn's Web developer Chris Montgomery joked he "came out from the shadows" to accept the award on his team's behalf after they faced stiff competition from nonprofit cafe The Monkey & The Elephant and scholarship app Scholly. Trailers for all three "Feature Length Indie Film of the Year" nominees riled up the crowd. Ultimately, the knee-slapping "I Am Santa Claus," a documentary that followed four Santa Claus cosplayers during the offseason, won. On stage, director Tommy Avallone joked that the third time was the charm, as he has lost two prior Geek Award nominations. Young Involved Philadelphia, WHYY and the Committee of Seventy's City Council Candidate Convention won "Event of the Year" over Blackstar Film Festival and J-1 Con. Their event saw 400 young voters head to the WHYY studio to hear 23 candidates chat about how the Council spends $4.5 billion each year. Finally, Ather Sharif, the founder and researcher at EvoXLabs, was crowned "Geek of the Year." A software engineer, Web developer and Google Scholar, Sharif pivoted to focus on creating accessible websites and apps after suffering a spinal cord injury that left him a quadriplegic in 2013. He's also founded the SCI Video Blog for everyday tutorials for people with spinal cord injuries. Sharif received a well-deserved standing ovation, but not before leaving each geek in the room with words of inspiration: "No matter what your limitations are, you should never give up. Life goes on." As the ceremony closed out, the night's guests filed back into the humid night. Then they headed to the after-party, after using their iPhones to schedule an Uber ride, of course.